The US Environmental Protection Agency (EPA) mission to improve air quality has resulted in increased demand for effective ways of air quality monitoring. One such method is the monitoring of the elements present in the airborne ambient matter collected on dust filters in recreational, residential and industrial areas. XRF (X-ray fluorescence) is the most popular method for the measurement of this collected matter as the method is highly sensitive and non-destructive. The ARL™ QUANT’X Energy Dispersive X-Ray Fluorescence (EDXRF) system, from Thermo Scientific™, is perfect for the measurement of the different elements collected on filters. The system sits easily on a lab benchtop and can be used for the accurate measurement of all the elements between (and including) sodium and americium. The system can work with filters of sizes between 25 – 47 mm when using a sample changer, or up to 220 mm with manual loading, with little sample preparation required. The system uses a revolutionary silicon drift detector (SDD), which reduces the impact of spectral interference; meaning clean, high-quality data is collected. The detector has a large 30 mm2 working area that provides a large solid angle for the efficient collection of X-ray signals. Sensitivity over a wide element range is provided using a high-flux rhodium anode tube (for X-ray propogation), which can directly irradiate the sample or can work alongside 9 different filters to provide different excitation wavelengths. SDD provides a typical resolution of 135 eV when using a Mn K-a source. The ARL QUANT’X uses filtered X-ray radiation to excite the sample under optimum conditions, resulting in the fluorescence of the sample’s different elements. The system reduces noise and provides a tailored excitation wavelength by the use of a nine-position filter wheel. The various acquisition parameters are selected for optimal excitation of the elements of concern and best limits of detection. There is no need to prepare the air filter prior to analysis. All that is required is a simple check to make sure the filter has no defects that could impact the measurement. Analysis of the filter takes place under vacuum conditions, to avoid measurement of elements in the ambient air and therefore improve sensitivity towards light elements. The filters, if larger than 31 mm in diameter, can be loaded 10 at a time into an auto-sampler tray or, if smaller than 31 mm in diameter, a 20-position tray can be used. The auto-sampler tray has removable sample holders for the loading of filters of different sizes. The analysis method followed is a modified version of U.S. EPA Compendium Method IO-3.3 (Determination of Metals in Ambient Particulate Matter). Individual empirical calibrations can be carried out using commercial thin film standards (single or dual element) and blank films provided by MicroMatter, Technologies Inc. The calibrations are verified using a National Institute of Standards and Technology (NIST) standard reference material (SRM) 2783 Air particulate on filter media. Figure 1. Spectrum of NIST SRM 2783. The spectrum of NIST SRM 2783 taken using the ARL QUANT’X, with elements of interest identified, is shown in Figure 1. This spectrum was taken at a 50 kV excitation voltage over a time period of 300 seconds, and a thick palladium filter was used. The high spectral resolution and high signal-to-noise ration make it simple to identify individual elemental signals. The five excitation conditions that are perfect for different element types are shown in Table 1. A total measurement time of 25 minutes is needed for each sample; depending on the needs of the experiment the measurement time per sample can be adjusted. The net peak intensities, with peak overlaps removed, are automatically calculated by the WinTrace Software’s advanced deconvolution algorithm. This provides more comprehensive data than using a region of interest (ROI) approach. The use of minimum detection limits (MDLs) is important as they describe the limitations of the data collected. The repeated measurement of lab blanks can be used to determine the MDLs for air filter analysis. Table 2. Comparison of ARL QUANT’X Spectrometer limits of detection and U.S. EPA method. Table 2 shows MDLs calculated using the average uncertainty from the analysis of 10 blanks using the ARL QUANT’X. When this data is compared to the U.S. EPA Compendium Method IO-3.3 the measured MDLs are reported as 1σ (68% confidence level). For most of the elements listed the MDLs possible using the ARL QUANT’X are at least as good, if not better, than the levels given in the U.S. EPA Compendium Method IO-3.3. The system’s detection levels range between 1 ng/cm2 - 21 ng/cm2. For some of the elements in Table 2 an extra value is given in brackets, this value is the MDL 1σ value for the element’s L line. Whilst L lines tend to be impacted more by spectral interference than K lines, they can sometimes provide a better MDL. Figure 2 shows a graph of the 1σ MDLs possible using the ARL QUANT’X vs. those in the U.S. EPA Compendium Method IO-3.3. Figure 2. Comparison of ARL QUANT’X Spectrometer limits of detection and U.S. EPA method. 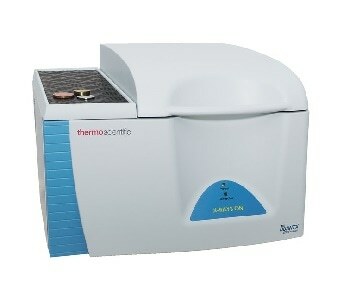 The results described demonstrate the ARL QUANT’X Spectrometer’s excellent performance for the analysis of air filters. The detection limits for different elements sit between values of less than 1 ng/cm2 to a few ng/cm2, with performance being great for both light and heavy elements. All of the detection limits of the ARL QUANT’X Spectrometer are lower than those given in the EPA’s Compendium Method IO-3.3.